This person article needs cleanup. Please review Wikiquote:Templates, especially the standard format of people articles, to determine how to edit this article to conform to a higher standard of article quality. You should also check this article's talk page to see if the person who added this message left an explanation there. This page has been listed as needing cleanup since 2007-04-05. 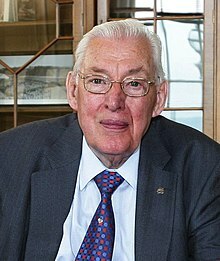 The Reverend Ian Richard Kyle Paisley (born April 6, 1926 - September 12, 2014) was a politician and church leader in Northern Ireland. "There's a silence in this house today. There's a silence all over Northern Ireland today. There's grieving and there is despair. But behind the despair, there is being born a unity that we haven't seen before... I would like to commend publicly here today the priest of Antrim, the Roman Catholic priest. He made one of the greatest speeches I've ever heard from any of the cloth and he really said in Down to everyone that he did not want in his parish anybody like these men who did this task. And those of us who know Northern Ireland know that it takes some show of strength in a place like Antrim to say those words... We're coming up to St. Patrick's Day. St. Patrick preached the gospel of Jesus Christ in Ireland. And I was just thinking today, the only thing these murderers have done: they have desecrated the shamrock by trying to pour the blood of their innocent victims upon it." "I have read in the Book of Revelation the power of the word of testimony, but I never realised what power was in a martyr's testimony. If I had brought a ton of explosives and let them off in that Assembly it could not have had a greater effect. That vast Assembly erupted, and the books started to fly and the punches started to be thrown, and the kicking started, but I held my ground and maintained my testimony. THERE IS NO DIFFERENCE BETWEEN EUROPE TODAY AND EUROPE IN REFORMATION TIMES. This afternoon I read again the story of Luther, at the Diet of Worms. Who presided over the Diet of Worms? The Emperor Charles, Head of the Holy Roman Empire. Who was he? He was a Habsburg. It is interesting to note that one of the men who attacked me is the last of the Habsburgs-Otto Habsburg, the Pretender to the Crown of Austria and Hungary. I said to myself, 'The Habsburgs are still lusting for Protestant blood. They are still the same as they were in the days of Luther.' The members of the Roman Catholic Party of Mr. Le Pen of which John Taylor is a member were round me battering away at me as hard as they could"